Bruny Island offers so much. The scenery is amazing, the local produce is some of Australia's best, and it has a rich indigenous history. You will see so much in a day on this tour and will leave knowing why Bruny Island is such a special place. Enjoy shucked oysters, taken from the sea only metres away! Located at the mouth of the River Derwent, Bruny Island one of Tasmania’s best natural highlights. 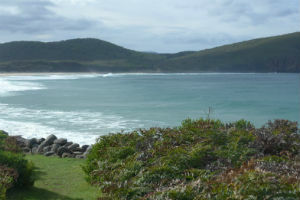 Bruny Island is home to unique wildlife (including the white Bennetts wallabies), amazing scenery, rich indigenous history and delicious local produce. After a short ferry ride across the D’entrecasteaux Channel we’ll head to Cape Bruny and the Bruny Island Lighthouse, stopping along the way for some spectacular views at the Neck lookout. Next we’ll enjoy great coastal walks and stunning beaches, including Adventure Bay for a quick swim (conditions permitting) before we look for the local white Bennetts wallabies. The highlights continue throughout the afternoon as we sample some of the best local produce this island has to offer at the Bruny Island Cheese Company and Get Shucked Oyster Farm. Itinerary may be varied so you get the most out of your day. We pick up from any centrally located Hotel or Hostel. If you aren't staying in a hotel, we can arrange to collect you from the Tasmanian Travel and Information Centre on Davey Street. Departs Tuesdays and Thursdays year-round, as well as selected Mondays, Fridays and Sundays during peak periods. Minimum age to join tour is 8 years. Children between 8 and 18 years pay the adult rate, and must travel with a parent or legal guardian.